Naim's high-end network music player, the NDX, due in November | What Hi-Fi? The new model, which will sell for £2995 when it reaches the shops in November, has all the features of the current Naim client units, but is designed to be used with the company's reference series amplification. In addition, it can be upgraded with the addition of an XPS or PS555 external power supply and/or a Naim DAC. The NDX has both analogue and digital outputs, and as well as network music playback has onboard internet radio (using the vTuner 5* service), an optional FM/DAB module, three digital inputs and both digital iPod/iPhone input and USB playback. It can be controlled by the handset supplied or a forthcoming version of Naim's n-Stream iPod Touch/iPhone/iPad app, which will also give control over the company's preamps. The digital-to-analogue section of the NDX is based on Naim's experience in designing its first standalone DAC: SHARC DSP-based buffering with fixed clocks combines with 16x oversampling and proprietary digital filtering algorithms. Naim explains that 'the audio data clocks into the memory at the incoming inconsistently timed rate and then a precise clock controls the data out of the memory and into the DAC chips. Selecting the master clock that best matches the average incoming clock frequency, controls the rate at which the memory fills and empties. The power supply uses a 200VA toroidal transformer with separate windings feeding power supplies for the digital, analogue, DSP and clock sections, and the key sections of the NDX are both physically and electrically separated, with optical connections being used to ensure isolation. The NDX will stream and play WAV, FLAC, AIFF, AAC WMA, Ogg Vorbis and MP3 files, and supports gapless playback. 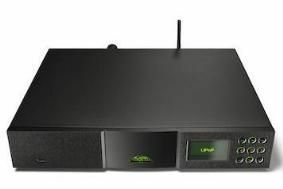 While it has integrated Wi-Fi, Naim says this is provided purely for convenience, and advises the use of a wired Ethernet connection for the best possible performance.